Police have warned of traffic disruption with a number of Royal Black Preceptory parades being held in County Antrim. 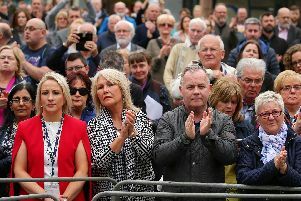 The main Ballymena parade will start at 12noon from Ballee playing fields and the public should expect disruption in the Harryville, Galgorm Road, Linenhall Street and Larne Road Link areas. Diversions will be in place. The return parade is expected to finish at 6pm. There will be feeder parades before and after. The Larne RBP parade is due to start at 12.30pm at Station Road/Church Road and finish at 6pm approximately. Diversions will be in place. The main A2 through Larne will be closed due to the parade. All coastal traffic from A8 will be diverted at Antiville Road Roundabout and Pound Street. All traffic coming along Coast Road from Ballygally (destined for Carrickfergus or Belfast) will be diverted at Branch Road and/or Victoria Road.